A comedy drama: teenage siblings Joni and Laser live with their two mothers, Nic and Jules, lesbian life partners who both used the same sperm donor to have them. Laser convinces Joni to contact the donor, she does, and he bonds with the teens. Hard-working Nic is wary of the donor, while free-spirited Jules creates a tentative rapport with him and agrees to landscape his garden. Annette Bening (American Beauty) and Julianne Moore (Children of Men) play Nic and Jules and are completely convincing as a couple. Child-rearing and two decades of marriage has put a strain on their relationship, which is only exacerbated when the sperm donor, Paul, played by Mark Ruffalo, (Shutter Island) enters the picture. The kids are well-adjusted and okay with the inevitability of change, signalled by the entry of Paul, but the adults have a harder time coping. Astutely directed (Lisa Cholodenko, High Art), this is a keenly observed portrait of marriage tested, and of human behaviour in the face of change. 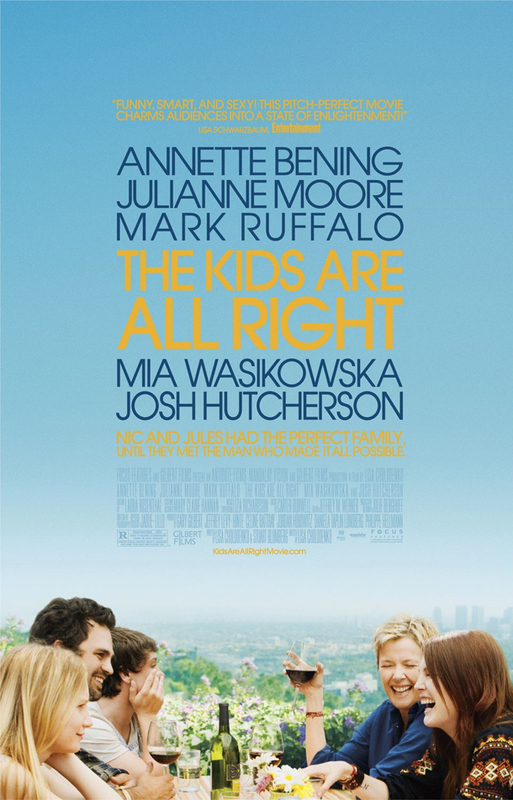 A taut, modern, relevant and funny film whose characters and their actions are utterly relatable.